Boxcutters, Jigger, Mixing-glass, Strainer, Stirrer (long Spoon), Coupe Glass. Combine all Ingredients in an ice-filled Mixing Glass. 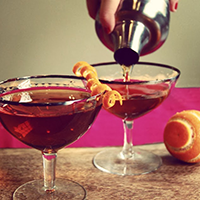 Stir and strain into a chilled Coupe. Express the oils from the Orange twist over the finished drink and garnish with the peel. Serve.